The [31st North Carolina] regiment was now ordered into the trenches at Petersburg, and participated in all the hard fought battles in that vicinity. 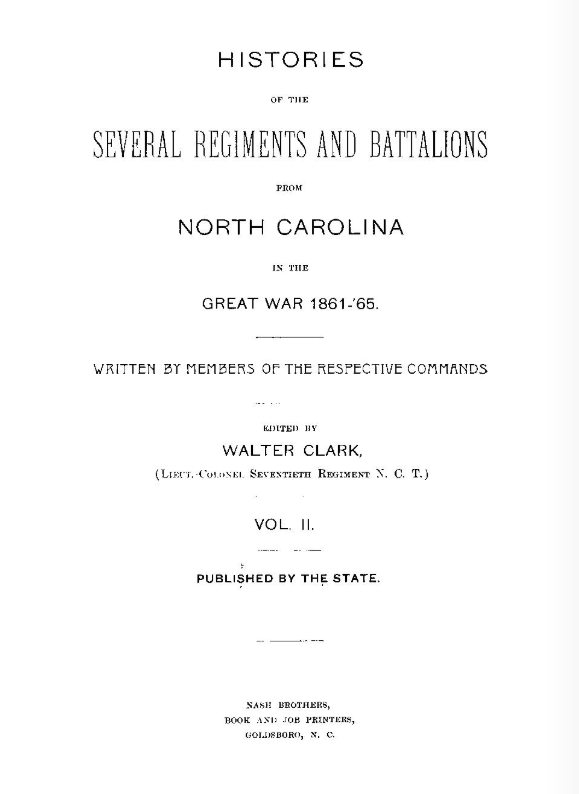 In the battle of Fort Harrison [on September 29-30, 1864], one of the severest actions occurring on that front, Clingman’s Brigade, and particularly the Thirty-first [North Carolina] Regiment, suffered terribly, so that when one of the writers, Adjutant [E. K.] Bryan, returned to the Regiment only a few days after this battle (date not remembered) he found the entire Regiment consisted of only about sixty men, commanded by First Lieutenant [Edward J.] Williams, the ranking officer present. The command was ordered to Wilmington to participate in the defense of Fort Fisher 13 January, 1865. They took no part in the action, however, as General Bragg and General Hoke concluded that the situation was extremely hazardous, as the enemy had already landed and thrown up works entirely across the peninsula, which were manned by heavy lines of infantry, which, together with their navy, which could sweep the beach with canister and grape at short range, would in all probability have virtually annihilated the division. We fell back to Sugar Loaf and engaged the enemy as they advanced, checking them, and afterwards falling back to Wilmington and through the city to the Northeast branch of the Cape Fear, which we crossed on pontoons, the advance of the enemy arriving at the south bank just as our last troops had gotten across the river, and our pontoons cut loose. We now marched to Goldsboro and Smithfield, where we waited the advance of Sherman from Fayetteville. The clash of arms came now again at Bentonville, N. C, 19 March, 1865. For two days General Johnston held in check Sherman’s 70,000 men, with not more than 20,000 of all arms. After two days’ successful resistance Johnston, finding the Federals in overwhelming force concentrated on three sides of him, withdrew that night towards Raleigh. The retreat was continued to High Point, N. C, and at the quiet little village of Bush Hill, about two miles from High Point, the command was surrendered to General Sherman, our paroles being dated 1 May, 1865.